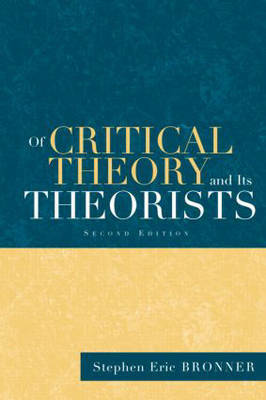 Of Critical Theory and its Theorists is an intelligent , accessible overview of the entire Critical Theory Tradition, written by one of the leading experts on the subject. Filled with original insights and valuable historical narratives, Of Critical Theory and Its Theorists covers the work of major philosphical thinkers such as Benjamin, Horkheimer, Adorno, Marcuse and Habermas and revisits the contributions of lesser-known figures such as Karl Korsch and Ernst Bloch. Bronner measures the writing of these theorists against each other, postmodernist philosophers and the critical tradition reaching back to Hegel. Of Critical Theory and Its Thoerists presents new insights useful to experienced scholars and offers clear summaries for students making this book an ideal introduction to the debates surrounding one of the most important intellectual traditions of the 20th Century. "A fine and probing piece of theoretical scholarship.."
""Of Critical Theory and Its Theorists does not disappoint . . . A compelling account of the history of critical theory and a useful guide for advanced graduate students and scholars. Bronner's understanding of the dialectical method is exemplary, and his explanation of it is excellent. A remarkable work.."
"Has the foundation of critical theory been withdrawn with the collapse of communism? Stephen Eric Bronner argues the opposite: only now, liberated from marxian dogmatism, can a genuine critique of modern society begin. He develops his ideas in an immanent and emancipatory confrontation with critical theory and its proponents. A brilliant book! Don't miss it!." "Very well written, readily accessible and largely free of jargon. There is no other single work on critical theory that offers such a unique range of thinkers and their ideas.-Mort Schoolman, SUNY Albany.."